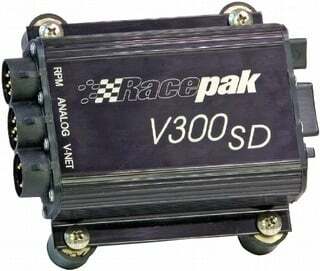 The affordable V300SD series data recorder is our newest data recorder. In base configuration, the V300 monitors six parameters, but it can be expanded to monitor up to 67 channels of data to meet the needs of most users. The V300SD can sample data as quickly as 1000 times per second. Uploading recorded data to your computer is done via a SD memory card, which provides you with hours of recording time and the ability to store many runs prior to uploading the data. The V300SD also has multiple methods of displaying monitored data in real time. When linked by serial cable to your PC you can view all recorded functions in either graph format or on 8 virtual gauges while the vehicle is running. Any monitored function can also be displayed in real time on Racepak?s optional Intelli-Gauges or Ultra Dash.